With the help of their selected character’s special skills, players take it in turns to earn gold and raise buildings. The characters are then returned to the deck and a new round of selection and building starts. Once a sufficiently grand citadel is complete, 30 to 60 minutes later, the players count up the value of their buildings to find the winner. This is an easy game to pick up and to teach. The important rules are all in the skills of each character, which are written on the individual character cards. Simply playing through a round of the game is enough to teach newcomers all they need to know. Yet the wide variety of skills available to the eight (or nine with more players) characters opens up many interesting strategies. Games are also short, so if the odds are not in your favour, there’s always the chance for another game to reverse your fortunes. If there is a weakness in the game, the process of selecting characters can drag. The game comes to a grinding halt as each player peruses the deck of available characters when choosing their assistant for that round. Newcomers unfamiliar with the different skills or oldtimers considering all the options can take a long time to come to a decision. Introducing a “10 second rule” may be a wise move to keep up the pace and shave 20 minutes off the playing time. 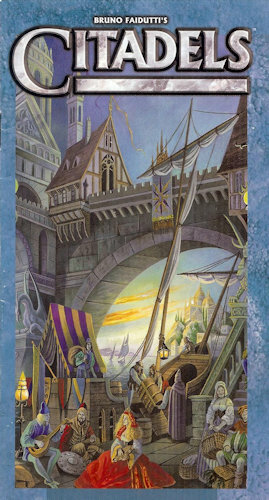 Quick and fun to play, with varied strategies to contemplate, Citadels is a game well worth seeking out.